There are several things that a business requires to enjoy a successful run at a trade show. You need to be creative, organized, resilient and have deep pockets. Companies are required to shell out a large amount of money to secure themselves a good spot at a well-known trade show – but is it all worth it? The short answer is yes. Trade shows allow companies to meet several marketing goals all at once, making them worth every single penny that is spent on them. Unfortunately, success at these events isn’t always guaranteed. To enjoy a profitable run at a trade show, it’s imperative that you do your research and start planning months in advance. If you aren’t sure about where to start, don’t worry. Your booth’s size and location will have a huge impact on your success, so it’s important to secure a convenient and strategic location well in advance. Bigger booths are typically located near the front of the hall, so they see a higher footfall than booths at the back. If you don’t have the kind of funds required to book a larger space, don’t sweat it. Find yourself a 10×10 in-line booth that is near a food court or lounge area. Once you’ve zeroed in on your booth size and location, you can work on creating captivating graphics that will draw the crowds to your display. At a trade show, you will have just a few seconds in which you need to capture an individual’s attention and compel them to visit your booth. To generate curiosity about your brand, think about how you can present yourself on the show floor. Come up with a theme that ties in with your marketing goals and use it as the overarching concept for your display. Once you’ve zeroed in on a theme, think about the kind of message you want visitors to take away from your booth. Create aesthetically-pleasing banners and graphics that clearly showcase what your brand can offer to visitors at the event. Remember, you won’t get a second chance to make a first impression, so let your booth do all the initial talking. Don’t be afraid to incorporate technology into your booth’s fundamental design. If you can think of a creative way to do things differently, go ahead and follow your gut. Innovative ideas will stick out and draw attention to your exhibit booth. Finally, spend a little time thinking about how you can utilize all the space in your booth without it looking too overcrowded. Think about empty spaces and how you can use them to your advantage. Your brand’s colors and logo should be used extensively through your display to encourage brand recall even after the event is over. The design process may take a little time, but it will definitely boost your overall trade show experience. To be interesting, you have to show some interest first. It’s a huge turn-off for customers when they walk past a trade show booth and the staff seems uninterested, are chit-chatting, or don’t even bother to answer when spoken to. Tell your staff to go out into the aisles and welcome traffic into your space. If you’d like to strike up a conversation, ask questions about your customers’ needs and take interest in their answers. Remember, you might be able to obtain some valuable information that will benefit you in the long run. When you approach a potential client, make sure you aren’t too overbearing. Introduce yourself and ask if they want any help. If they refuse, it’s a good idea to back off and let them find you when they’re ready. If the individual shows interest in taking the conversation further, remember to listen before you speak. Try to understand their requirements before you bombard them with information about your offerings. During the trade show, it’s important that every member of staff is completely familiar with your brand, its offerings and your trade show goals. When people enter your booth, your employees should be able to dazzle them with their impeccable knowledge about how your brand can add value to the client’s life. This is why it’s crucial for you to choose your host and kiosk staff carefully. They need to be able to communicate clearly and effectively while also being as friendly, approachable and cheerful as possible. Marketing for your trade show can be done in a very engaging and creative manner on a number of social media platforms. You could use these platforms to invite people to the event and send out reminders as the big day approaches. In the run-up to the trade show, you can increase engagement online by posting images and videos showcasing what you’re bringing to the event and how you’re preparing. To reach out to the widest possible audience, don’t forget to use the event’s official hashtag with all your posts. During the event, you can go live on your social media pages so that people know what they can expect if they’re attending or what they’re missing out on if they can’t make it. You can also ask visitors to your booth to post their content on your page since client-generated content typically garners positive reviews online. Finally, once the event is over, you can post images, whitepapers and videos from the event on your social media handles. This will help drive engagement and participation at your next event. Even at the best of times, trade shows can be exhausting and tiring for visitors who are on their feet, walking from one booth to the next. You can break the monotony and drive up engagement by hosting contests and other fun events in your space. If you have limited space, you could do something as simple as a raffle draw, which will also help you gather leads. You can ask visitors to your booth to drop their business cards into your raffle box or drum for a chance to win an exciting prize at the end of the day. If you have a bit more space, you could consider hosting active games or even a quiz to invite more people to your booth. Whatever you opt to do, ensure that your prizes are enticing enough to draw in large crowds. The products that you hand out to potential customers and visitors to your booth will say a lot about your brand. In today’s environment, products that are eco-friendly and reusable generally garner the most attention. You could hand out branded canvas bags that are filled with battery packs, USB drives or even Bluetooth speakers and headphones. If you’re on a tight budget, you could provide every visitor to your booths with a smaller giveaway, such as a notepad or pen, and reserve the bigger gifts for potential leads who have shown a genuine interest in your brand or completed a purchase at the event. Another interesting giveaway is a discount voucher that can be redeemed at a later date on the purchase of any of your offerings. It’s one way to ensure people come back to you and your brand even after the event is over. Additionally, if customers fail to use the voucher provided, you won’t lose out on anything. As we’ve mentioned earlier, trade shows can be incredibly tiring for visitors. Your booth should serve as a safe place where they can come and unwind for a little while. You can start small, by offering comfortable chairs for people to sit on while you deliver your pitch to them. If you can, offer refreshments like tea, coffee, water and fruit juices. You could also have staff members offer biscuits and other finger foods. This will make the visitor feel comfortable and ease. If you’ve got a large booth, you could consider creating a lounge area with charging stations and comfortable recliners. You can also use essential aroma oils to make the environment peaceful. Remember, a relaxed visitor is far more likely to listen to what you have to say that an irritable and uncomfortable one. Once the event is over, don’t waste any time before following up with all the leads and new contacts you’ve gathered during the show. 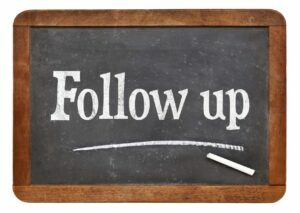 The faster you follow up, the more likely people are to remember you and why they interacted with you at the event. Typically, have your staff follow up the same evening or the following morning. Your prompt action will also foster a positive relationship between you and your potential client. Even if the first call doesn’t end in a lucrative deal, you should remember to thank the customer for their time and ask them for feedback. This will help you learn from your mistakes and improve at future events. Finally, store their details in your database and reach out to them before your next trade show – who knows, that might be where you will seal the deal! Planning and preparing for a trade show isn’t always easy, but with these tips, you will be well on your way to tasting success at the end of every event.